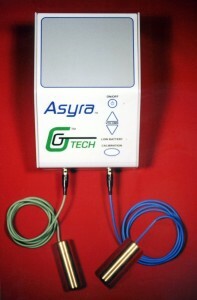 Asyra Pro is a tenth generation Electro-Acupuncture by Voll device (EAV). See History and Development. This technology is able to identify nutritional remedies that will affect your causal issues. The Asyra testing process begins by taking energetic readings and measuring the body’s capacitive reaction. Through the process, customized filters (frequencies) relating to specific issues (such as chemical toxins, allergies, digestion, etc.) are output. If any of these filters creates a disturbance to any energetic component, cellular component, tissue, organ, or system of the body, the negative response will be registered by the patient’s body through the Asyra Pro. The system will then automatically load remedies that are useful for restoring homeostasis or balance. It will then quickly scan through these until the patient’s body identifies the remedy that will remove the underlying disturbance and allow the patient to obtain an improved level of health. The remedy is then placed in the Hold Tank to store your results. The Hold Tank stores both the filters that created an imbalance / disturbance and the remedies that allow you to restore homeostasis, balance, or improved health. Metabolic Disturbances • Sleep Disturbances • And more . . .
On average, three to twelve visits are needed to fully restore optimum health. After each visit, you should notice positive changes in your health.